What is the “effect video”or “effects of video games”? We’ve got a video material and we need to effect video to make it satisfactory, just like the advertisement. And what shall we do? The solution is those various video effect software. What are effects for videos? Generally speaking, we add our videos into software, and adjust the brightness, contrast and saturation, add special visual effects to videos and make other advanced settings, for example, to convert the videos into other format, and those are called effects for video. Effect video is a significant aspect in video editing, meanwhile, it will bring us various editing experience. As beginners, we must pay much attention to choosing the software. 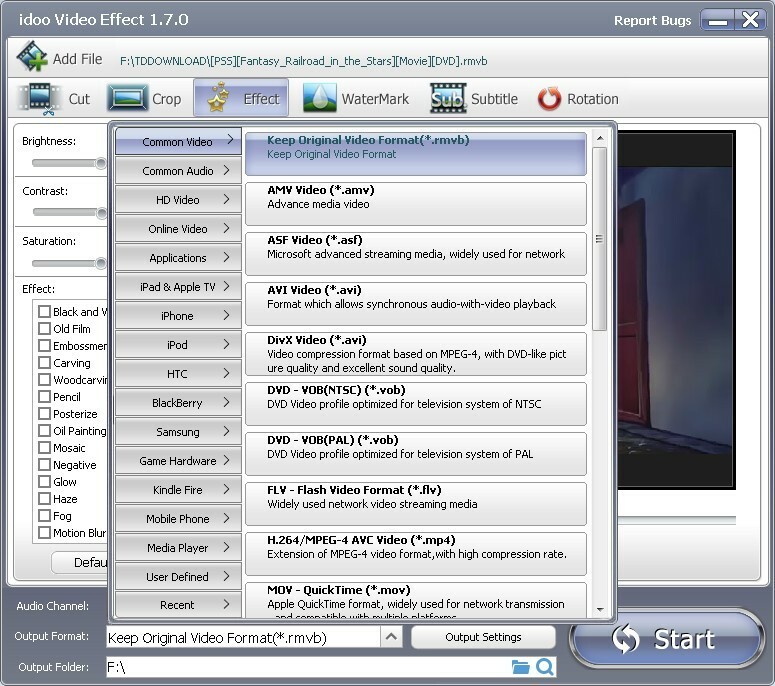 What kind of software can meet our demands of video effecting, and also easy to handle? 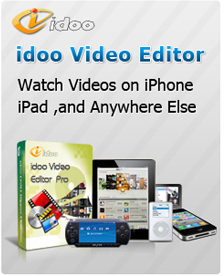 idoo Video Editor is a powerful software with clear interface and full function. Moreover, it integrated the advanced functions together, which is quite easy for elementary users. For instance, you may effect the video and convert the video format in one step, and that’s very efficient. 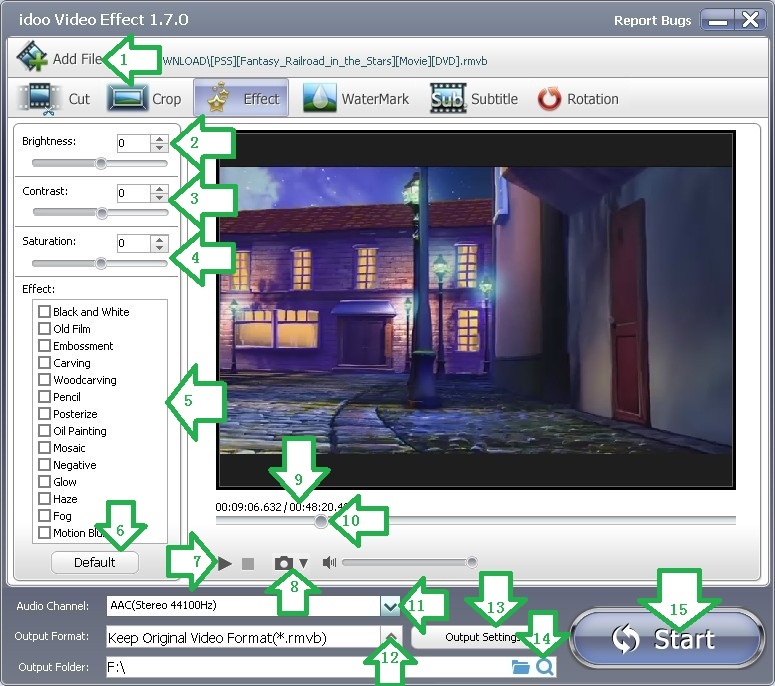 The following part will show you how to effect video by idoo Video Editor. 2. In the left box, you may adjust the brightness (Arrow2), contrast (Arrow3) and saturation (Arrow4). 3. There are more visual effects in the area below (Arrow5). 4. Click “Default” (Arrow6) to cancel current operation and return to default settings. 5. Click Arrow7 to play the video. 6. Click Arrow8 to capture the screen and select the type of output picture. 7. Below the preview box, the current time and the length of the video are shown (Arrow9), with millisecond precision. 8. By dragging the time slider (Arrow10), you may preview the video. 9. In “Audio Channel” (Arrow11), the information of the audio is shown. 10. Click the drag-down list of “Output Format” (Arrow12) to set the format of the output files. 11. The quality, size and other configurations of output files can be set in “Output Settings” (Arrow13). 12. You may open the folder where output files stored or directly open the output files (Arrow14). 13. Click “Start” (Arrow15) to begin editing. 14. 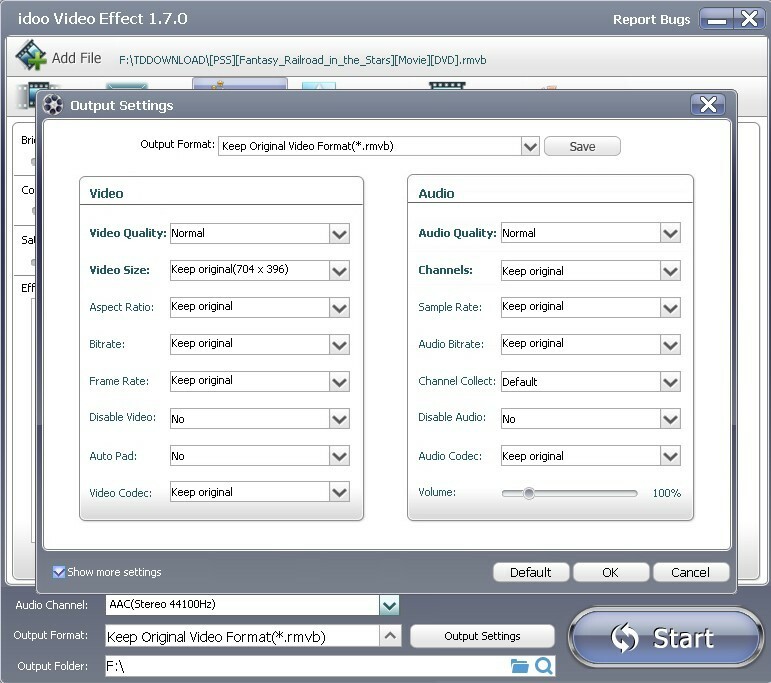 If you need to convert the video format, you may click “Output Format” (Arrow12) and select the format you want in list which is shown above. 15. By clicking “Output Settings” (Arrow13), the quality, size and other configurations of output files can be set in the dialog box. 16. When you finish all settings, click “Start” to begin editing. Then you may check the output file or edit it. How to convert the edited videos into formats for those social networks or media devices? How to preview and capture the screen while adding effects to video? How to add effects to video and convert it into other format at the same time? How to add effects to videos? How to add special effects to videos? How to effect video? How to watermark video? How to add watermark to video? how to cut wmv video? how to cut MP4 video? how to cut mov files? how to cut video clips? How to convert and split video for MAC? How to split audio from video? How to split AVI video? How to split movie by idoo video editor? How to split MP4 video files according to the time span?